One month after we reported that Israel would take the unprecedented step of sharing intelligence with Saudi Arabia as the two countries ramped up efforts to curb what they perceive as "Iranian expansion" in the region, on Thursday Israel's Channel 10 reported that Israel has also pivoted to the US and reached a similar plan to counter Iranian activity in the Middle East. As Axios adds, U.S. and Israeli officials said the joint understandings were reached in "a secret meeting" between senior Israeli and U.S. delegations at the White House on December 12th. Speaking to Axios, a senior U.S. official said that after two days of talks the U.S. and Israel "reached at a joint document which included understandings on countering Iranian actions in the region." The U.S. official said the document goal's was to translate President Trump's Iran speech to joint U.S.-Israeli strategic goals regarding Iran and to set up a joint work plan. On the Israeli side, the team was headed by national security adviser Meir Ben-Shabbat and included senior representatives of the Israeli military, including the Ministry of Defense, Foreign Ministry and intelligence community. The U.S. side was headed by national security adviser H.R. McMaster and included senior representatives from the National Security Council, State Department, Department of Defense and the intelligence community. Covert and diplomatic action to block Iran's path to nuclear weapons – according to the U.S. official this working group will deal with diplomatic steps that can be taken as part of the Iran nuclear deal to further monitor and verify that Iran is not violating the deal. It also includes diplomatic steps outside of the nuclear deal to put more pressure on Iran. The working group will deal with possible covert steps against the Iranian nuclear program. Countering Iranian activity in the region, especially the Iranian entrenchment efforts in Syria and the Iranian support for Hezbollah and other terror groups. This working group will also deal with drafting U.S.-Israeli policy regarding the "day after" in the Syrian civil war. Countering Iranian ballistic missiles development and the Iranian "precision project" aimed at manufacturing precision guided missiles in Syria and Lebanon for Hezbollah to be used against Israel in a future war. Joint U.S.-Israeli preparation for different escalation scenarios in the region concerning Iran, Syria, Hezbollah in Lebanon and Hamas in Gaza. After the (not so) "secret" meetings, senior Israeli officials confirmed the U.S. and Israel have arrived at strategic understandings regarding Iran that would strengthen the cooperation in countering regional challenges. 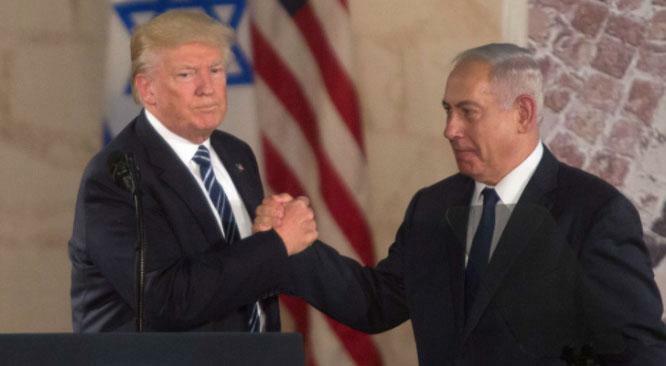 The Israeli official added that "[T]he U.S. and Israel see eye to eye the different developments in the region and especially those that are connected to Iran. We reached at understandings regarding the strategy and the policy needed to counter Iran. Our understandings deal with the overall strategy but also with concrete goals, way of action and the means which need to be used to get obtain those goals." Meanwhile, apparently unconcerned by the Saudi-Israeli-US axis that has formed to contain his nation, Iranian Supreme Leader Ayatollah Ali Khamenei said on Wednesday that US President Donald Trump would fail in his hardened stance towards Iran, saying Tehran is stronger than during the time of Ronald Reagan. "Reagan was more powerful and smarter than Trump, and he was a better actor in making threats, and he also moved against us and they shot down our plane," Khamenei said in a speech carried on state television. For now, the Iranian's Trump-tautning has remained unanswered. The problem is that if Iran continues to dare the US, and its new regional allies Israel and Saudi Arabia, now that there is a regional axis meant to "contain" Iran by any means necessary, it won't take much for the US, and especially Israel, to respond accordingly.